Last week I travelled to Athens and Santorini. I had heard mixed reviews about Athens but Santorini boasts a glowing report. Why wouldn’t it, have you seen the pictures? I put the opinions of others to the back of my mind regarding Athens and decided I would make up my mind after my adventure. Needless to say, I appreciated Athens for all that it offers. It is a diamond in the rough. Santorini will be discussed in Part 2. However, the only downfall is the challenge of procuring a nice healthy breakfast in the Plaka district at 9am on the weekend because nowhere opens till 11am. What the Greeks do well is an espresso freddo , of course they do other things well but I loved an espresso freddo or three on the regular. So much so, I am trying to re-create it now I am back in Abu Dhabi. A friend recommended places in Athens too, that appeal to the health and fitness fanatic in me. For accommodation in Athens I used booking.com and stayed in the Plaka District. This was central and it was convenient for walking all around the city. 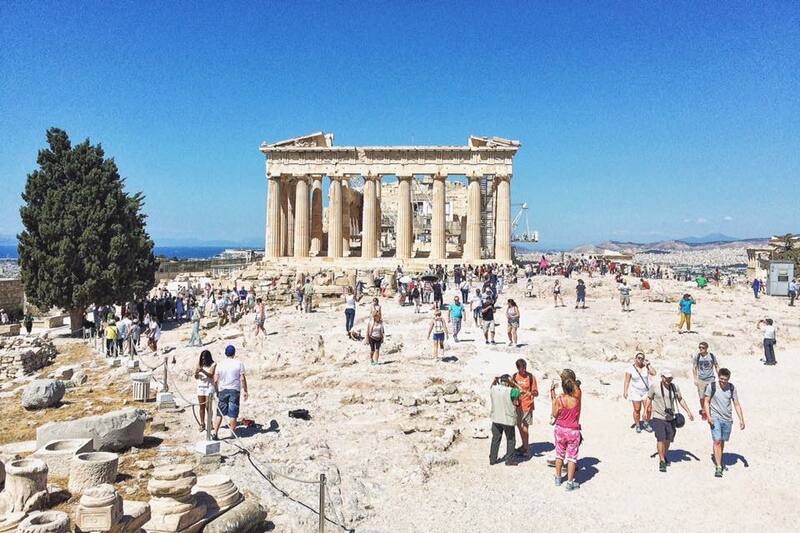 The city is huge and you can wander around all day admiring the architecture of Athens, there are many cafes and bars throughout the city and the more you explore the more intriguing Athens becomes. Watch the Sunset at Parko Thiseio. As you can see numerous gather with wine, guitars and food to watch the sunset over Athens on a giant marble rock, do not wear heels, I wore trainers. Athens Free Walking Tour : This tour was brilliant it lasted about 2.5 hours which takes you to all the main areas around the city – see images below. The tour is free but you can tip. Entrance to Acropolis is not provided with the walking tour because it is free. I emailed a few days before arriving to secure places on the tour as spaces are limited. You will learn about the history of Greece. Athens is jam packed with restaurants. It is a late city and there is a great buzz about the place from 8pm onwards. Strolling the streets and from recommendations I discovered these little gems which will appease the taste buds of meat eaters and vegans. Ipitou the Bar – this bar is cool and plays good tunes, it is close to Nolan restaurant and surrounded by other chilled out bars. Other restaurants not pictured, I recommend include Koi which serves sushi at a great price and Pure Bliss which serves local produce and delicious salads, it is very laid vibe where you could sit for hours drinking espresso freddo, sampling local wine and eating scrumptious food. Located in the same area as Pure Bliss, there are countless bars and cafes. No trip is complete without a gym session. Whilst in Athens I got a chance to to break a sweat in Planet Fitness, they offer a pay as you service which is handy and the gym is central. See Planet Fitness for more information. Concluding, Athens was fantastic trip filled with history , long walks, traditional greek food and wine, chilled out bars, street graffiti, espresso freddos,a few gym sessions and a new passion for front doors.